Google Chrome is the #1 web browser not only just because it is fast and simple to use but also because of constant development by chrome team to integrate new features into it. Microsoft, since of its windows 8 launch has been aggressively promoting its metro user interface through various social media and TV commercial the one song you would have probably remember “Take a chance, take a chance mujhe pe daav laaga” which featured windows 8’s metro interface. It will then Ask you ” How do you want to open this type of link (http)? 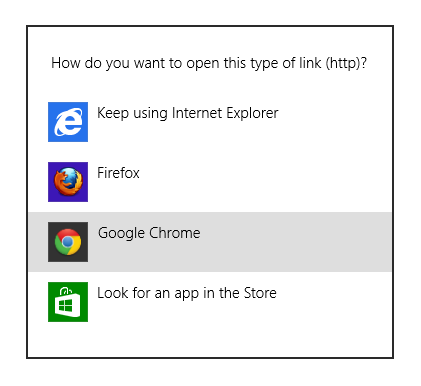 But keep one thing in mind after selecting Google Chrome to open http link your Internet Explorer 10 metro will not work. That’s it after that your chrome browser will be restart in metro interface. From, now onward whenever you click on Chrome button either from windows 8 start,desktop or from taskbar it will open it in chrome metro interface. There’s only a little bit of difference between Chrome desktop and Chrome metro. How Chrome metro is different from chrome desktop ? That’s it chrome will restart and will open in Chrome desktop mode as usual whenever you click on Chrome shortcut icon.